It was a case of so near, yet, so far. 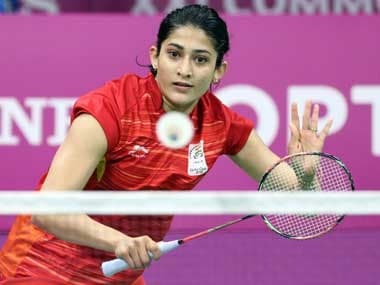 India’s sole surviving combatants in the Japan Open Superseries Badminton Championships, Pranaav Jerry Chopra and N Sikki Reddy, came within a heartbeat of securing victory in the mixed doubles semi-finals against the unranked Japanese pair of Takuro Hoki and Sayaka Hirota, but stumbled on the threshold of what would have been a sensational triumph, and crashed out of the $325,000 event by a 21-14, 15-21, 19-21 scoreline. Having knocked out two Japanese pairs in their initial two outings, and the South Korean pair of Seo Seung Jae and Kim Ha Na in the quarter-finals, Chopra and Reddy shared the first two games of their penultimate round joust against the Japanese qualifiers, and then fought back from a potentially fatal mid-game slump in the decider, just as they had done against the Koreans the previous day. But, whereas they had clung on to convert 11-16 and 16-19 deficits into a 21-19 victory against the Koreans, they clawed their way back after trailing 9-13, 12-16 and, coincidentally enough, 16-19 against Hoki and Hirota, to be a solitary point in the red at 19-20. And there they remained, as the unconsidered Japanese pair took the all-important 21st point, to shatter the Indians’ dreams of becoming the first pair from their country to reach a Superseries final. It was a golden opportunity for Chopra and the left-handed Reddy to match the record of their illustrious predecessors, V Diju and Jwala Gutta, who had reached the title round of the 2009 BWF Superseries Masters finals. In their prime, these two outstanding players had reached as high as No 11 in the world, and had also qualified for the Olympics. The right-left combination of Diju and Gutta has three Grand Prix titles to its credit – the Bitburger Open, Bulgarian Open, and the Chinese Taipei Grand Prix Gold. They also made it to the quarter-finals of the 2009 World Championships, held on home soil in Hyderabad, but failed to make the medal round. With Indian interest in the Japan Open coming to an end with the eclipse of Chopra and Reddy, the spotlight got squarely trained on the two individual singles events, where Datuk (Malaysian equivalent of the English ‘Lord’) Lee Chong Wei easily dismantled the lukewarm challenge of China’s second-seeded Shi Yuqi at 21-19, 21-8, and went into Sunday’s title clash with recently crowned Danish world champion Viktor Axelsen, who tamed top-seeded Korean, Son Wan Ho, by a 21-16, 21-16 scoreline. As for the women, two-time former world champion Carolina Marin was handed a cakewalk into the final, when her semi-final opponent, Nozomi Okuhara of the home nation withdrew before the start of the match, complaining of an injury in her knee. The Spanish left-hander, who bagged the gold medal at the 2016 Rio Olympics, will clash in Sunday’s final with the sixth-seeded Chinese left-hander He Bingjiao, who notched a 21-14, 25-23 win over her fellow-countrywoman, Chen Yufei. It will not be easy for the towering Dane to stop Lee from winning his seventh Japan Open title. The Malaysian, who had pocketed the crown last year for his sixth title in eight final appearances, out of ten years of participation in Tokyo, shrugged off the slight sluggishness he had shown in the final game of Thursday’s quarter-final against Taiwanese Chou Tien Chen, to hit top gear against the 20-year-old Shi, against whom he held a 2-0 lead in career meetings. The eventual result could hardly have been predicted when the Chinese player leaped out into a 12-4 lead, literally before Lee could get his bearings. While the veteran Malaysian ace tried his best to reel in the youngster, Shi still looked in total control at 16-10 and 17-12. All of a sudden, Lee upped the pace, as he has done so often in the past, and caught up with his adversary at 18-all. Controlling the net, and coming down with a heavy hand on anything even marginally short, Lee took three of the next four points to get his nose ahead in the match for the first time. With Shi being mentally broken, the second game was nothing more than a formality. Axelsen showed glimpses of the form that had enabled him to conquer Chen Long and Lin Dan in straight games, in successive rounds of the Glasgow World Championships last month, to be in total command of the proceedings. Using his prodigious height and reach, he employed the sharp crosscourt forehand smash to best effect, to have the stocky Korean top seed stretching forward ineffectually. The 29-year-old Son, who actually led his opponent 5-4 in career head-to-heads, had one purple patch that took him from a 0-4 deficit to a 10-6 lead. But there he was pegged back. Knowing that the slow shuttles would not net him points with powerful smashes, Axelsen showed his tactical acumen by employing steep half-smashes, alternating with deep clears, to keep the Korean on the run. Catching up at 12-all, the Dane piled on the pressure and left his rival struggling in his wake. The third-seeded world champion was ahead for virtually the entire duration of the second game, except when Son made one supreme effort and came back from 9-13 to neutralise at 15-all. The Danish star, however, remained in control, and went for the jugular, gobbling six of the final seven points, to make his second final in Tokyo. Axelsen had ended runner-up to Lin Dan in the 2015 Japan Open. Now that he has a world title under his belt, he will hope to go one better this time.